Location: near Lake Naivasha in the Rift Valley at 2 hours driving from Nairobi. Hell's Gate is at about 1900 m above sea level. Landscape: savannah with high rock boundaries from the Elsa Gate to the Ranger's Post (in the middle of the park). The Ranger's Post is at the beginning of the Ol Njorowa Gorge, a spectacular canyon with a small stream fed by water seeping from the rocks that form the canyon. The dead end side gorge is definitely worth a visit but is not always very accessible because of puddles of water and rocks that have broken from the walls of the gorge. Mammals: often seen in Hell's Gate are e.g. rock hyraxes on the Fischer's Tower, Cape buffaloes, Burchell's zebras, warthogs, baboons, hartebeests, Grant's gazelles, African elands and Masai giraffes. With a bit of luck you can find klipspringer antelopes or Chandler’s mountain reedbucks. To come across lions, you have to be extra lucky although one of our clients has seen one in the park. Bird species: 100+ bird species have been recorded in the park. The Rüppell's Griffon Vulture breeds in the steep rock boundaries about 2 km before reaching the Ranger's Post. This is the only place where this vulture breeds in Kenya. It's quite common that the vulture flies to Masai Mara and back in one day in search of food. Visitors: Hell's Gate can be quite busy with school groups. Mainly the gorge is frequented a lot by school parties. However in the savannah before the Ranger's Post it's nice walking or cycling. Beware of passing buses as it is usually very dusty. Although the park is very interesting for bird watchers, it's not often visited by tourists from Europe or America. The landscape is a one off. From the Mervyn Carnelley Raptor Hide you can observe vultures feasting on carcasses. This hide is rarely visited. Accommodation: within the park the only option is camping. Along Lake Naivasha there's a big range of lodges. We mostly book the Lake Naivasha Country Club or the Lake Naivasha Kongoni Lodge. 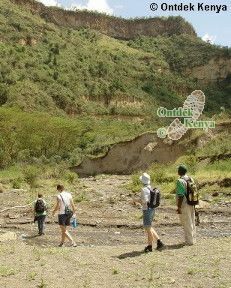 Good to know: the Ol Njorowa Gorge has stood as a source of inspiration for the decor of the Lion King. The Fischer's Tower and the Central Tower are volcanic plugs and are the only part left of two extinct volcanoes. Everything else around it, has eroded.